The ICRAF-ISRIC Soil VNIR Spectral Library contains visible near infrared spectra of 4,438 soils selected from the Soil Information System (ISIS) of the International Soil Reference and Information Centre (ISRIC). The samples consist of all physically archived samples at ISRIC in 2004 for which soil attribute data was available. The spectra were measured at the World Agroforestry Center's (ICRAF) Soil and Plant Spectral Diagnostic Laboratory. The samples are from 58 countries spanning Africa, Asia, Europe, North America, and South America. 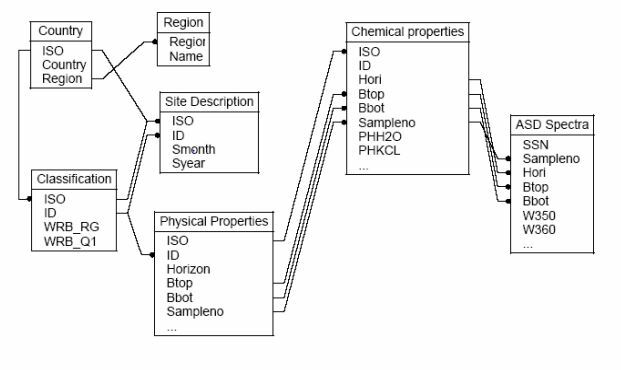 Associated attribute data, such as geographical coordinates, horizon (depth), and physical and chemical properties, are provided in a single relational database. The purpose of the library is to provide a resource for research and applications for sensing soil quality both in the laboratory and from space. Provide a resource for research and applications for sensing soil quality both in the laboratory and from space. World Agroforestry Centre (ICRAF) and ISRIC - World Soil Information. 2010. ICRAF-ISRIC Soil VNIR Spectral Library. Nairobi, Kenya: World Agroforestry Centre (ICRAF). 1081ac75-78f7-4db3-b8cc-23b78a3aa769 Access to the portal Read here the full details and access to the data.